The following recommendations are to ensure you receive the best possible result for your design. Please contact customer care with any questions as we are happy to go over any concerns. Please proofread and double-check your design before placing your order. It is solely your responsibility to ensure that your order is free of typographical errors, graphical errors (observing guidelines and image/text placement), color issues, poor image quality, etc. Plus, we want you to have a perfect product! :) We also offer a free online proofing site that you may use for your client to proof the design, make comments, and approve it. All AsukaBook templates have been set up to meet AsukaBook’s printer requirements, whether created by AsukaBook Maker or generated by the AsukaBook Photoshop or InDesign Tools. Each set is relative to a specific product. Photoshop and InDesign blank template details such as filename, resolution, dimension, and color space are already set and should not be changed. Case and cover template filenames will vary by product style. To assist you with your design, our templates include guidelines for trim, folds, divots, gutter, etc. Many of our cases and cover files include additional layout information details. If you are designing in Photoshop go to View > Show > Guides to turn on the guides and be sure to turn off or delete the cover and case layout details layers to prevent them from being printed. The outer blue guidelines are the trim lines. It is possible slight shifting may occur during the printing process and we do not recommend placing images/design directly up to the guideline. To ensure a full bleed to the edge of the page, extend the images and/or design must extend past the guidelines to the edge of the canvas. 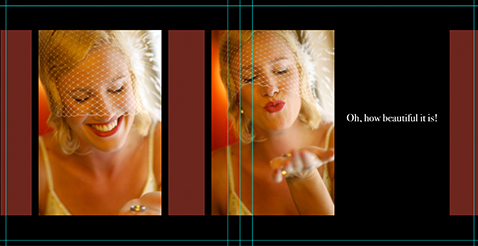 Place text and important parts of an image at least 1/4 inch inside of the guidelines if you do not want a full bleed. Full Bleed off to the edge of the canvas and no bleed. Our layflat binding allows for full spread design without gutter loss. Design freely, but keep in mind there will be a slight seam in the center of the spread. The center guides represent the area that will be lost once the book is bound. Approximately a 1/2 inch gutter loss will occur in our book bound books so it is recommended to avoid placing important parts of an image, text, or any graphic in the gutter area. 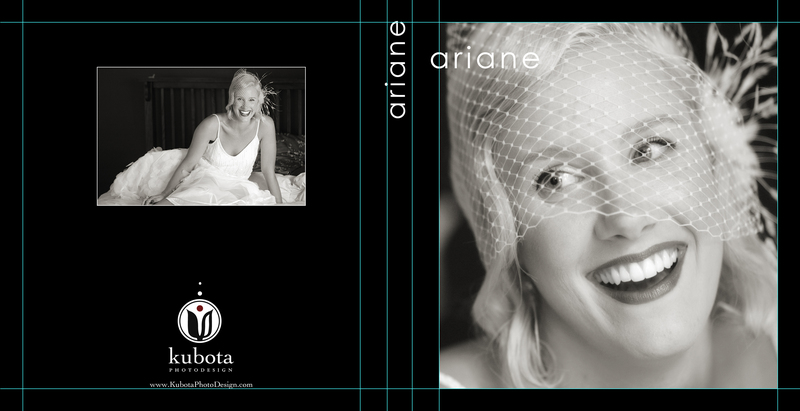 Designable covers have specific guidelines for each album style and many of the templates include an instructional layer. 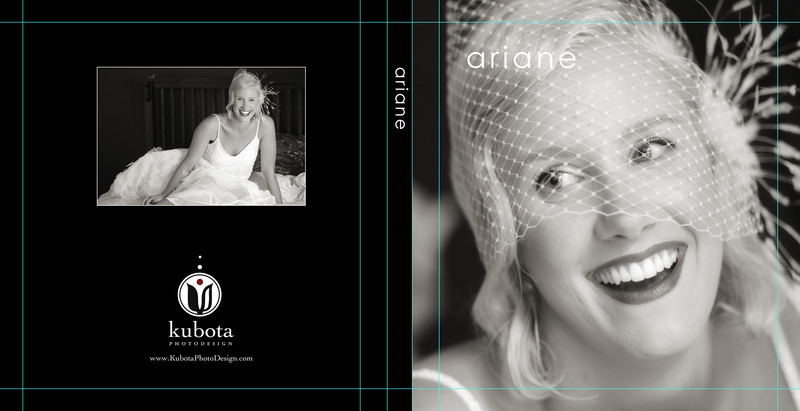 Be sure to turn off or delete the layer with instructions before saving your file or it will be printed on the cover. The divot on a cover is marked by guidelines or a shaded area. It is not recommended to place text, or important parts of an image, on or near the divot area. The cover and book jacket are printed from the same file. All of our albums include a case or presentation box specific to its style. Many of the cases are designable, and each one has specific guidelines. To best assist you, we have included an instructional layer and guides on the case files. Be sure to turn off or delete the layer with instructions before saving your file or it will be printed on your case. The presentation case for the NeoClassic, Zen Layflat Impact X, Zen Layflat Impact, Book Bound LX, and Book Bound FLX is designed with the front of the case on the right side of the template, and the back of the case on the left side of the template. The presentation cases for the Zen Layflat and Book Bound EXD books have a similar layout and are designed with the front of the case on the left side of the template, and the back of the case on the right. The shaded area should not be visible once assembled, but you may design with a full bleed into this area to ensure your design is consistent. The Art Layflat Book includes a gift style box with designable lift top and natural tan bottom. 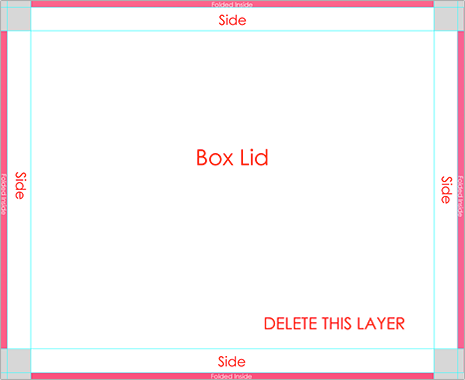 The case template allows you to design the top and sides of the box lid.